The churches of Sant Pere and Sant Vicenç, both located in the heart of the medieval town of Besalú, are two further fascinating examples of Romanesque architecture. The Monastery of Sant Pere was founded in 977 by Count-Bishop Miró and consecrated in 1003 by Count Bernat I (known historically as ‘Tallaferro’ or ‘Ironcleaver’). It was inhabited by a community of 12 monks. 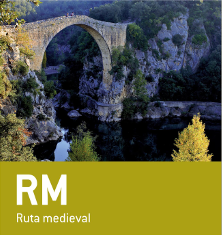 However, on the death of Count Tallaferro in 1020 the town of Besalú entered into a period of decline, which culminated in the year 1111 with its disappearance as an independent countdom. Henceforth, the monastery’s abbot became the town’s most powerful authority and had great political sway throughout the twelfth and thirteenth centuries. This church is of interest for its ambulatory, which allowed medieval pilgrims to enter the church without interrupting the holy ceremonies being held at the same time. In the Middle Ages, Besalú was an important centre of pilgrimage and so a hospice – Sant Julià – was built next to the monastery to provide shelter and sustenance for those passing through. Biblical scenes are depicted on the eight capitols on the columns that line the ambulatory. The church of Sant Vicenç may have been the first church constructed in the town as it is documented as part of the donations made by Count-Bishop Miró to the Monastery of Sant Genís i Sant Miquel in 977. It has a basilica floor plan with three naves, a crossing and three semi-circular apses. The central nave is higher than the lateral naves, and is covered by a slightly arched barrel-vault roof. The lateral naves, on the other hand, have half barrel-vault roofs. The Gothic façade has an attractive rose window and stained glass, while one sidewall boasts the imposing and well-preserved Romanesque doorway of Sant Rafel. The church houses the Gothic tomb of Pere de Rovira, which in the fifteenth century held the remains of Sant Vicenç Martyr.